Venue: Liberty Suite, Jericho’s Kitchen (no.12 on the Festival venues map ). The Liberty Suite is on the top floor, but there is a lift available. 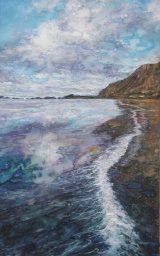 Established in Launceston in 1996, the Gwynngala group of artists has exhibited extensively in Cornwall and Devon (‘Gwynngala’ is Cornish for ‘September’ – the month of the group’s first ever exhibition) . A regular feature of the Charles Causley Festival, the group’s exhibition will showcase a varied selection of work including paintings, sculpture, jewellery and ceramics.